DALLAS, Feb. 27, 2018 /PRNewswire/ — Canary By Gorji celebrates its 15 year anniversary in March 2018. Beating the odds for success as an independent chef-driven restaurant in a major metropolitan area, especially one as competitive as Dallas-Fort Worth, is not an easy task. Instead of a “bigger is better” outlook, Gorji has kept it simple at his 8-table restaurant. “Less is more—and—definitely more sustainable,” says the chef. Celebrating with Venison, Langoustine and Lamb Skillet Pizzas & Wine Pairing with wines from France, Lebanon and Israel. Gorji Gourmet Foods were created by Chef Gorji and uses in his kitchen at Canary By Gorji. They help home cooks prepare gourmet dishes without spending hours in preparation. They include Pomegranate Vinaigrette, Dipping Oil/Marinade and three pasta & pizza sauces: Arrabiata Diavolo, Puttanesca and Pomodoro. All five products have won 21 awards in blind judging food competitions: 6 gold, 9 silver and 6 bronze. They are available in DFW Whole Foods, Royal Blue Grocery Stores, Jimmy’s Food Store and local specialty grocers. 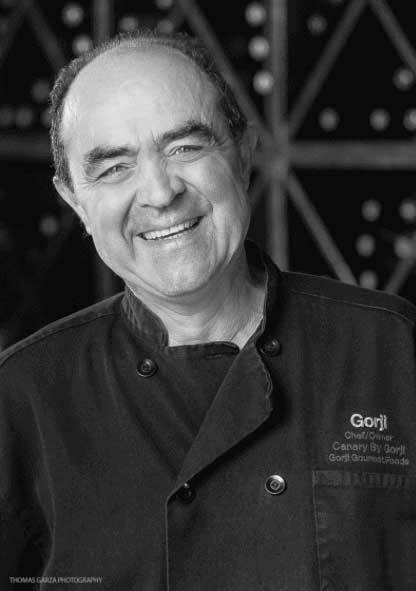 Gorji has been chef-owner of Canary By Gorji, an intimate 8-table restaurant in Dallas, TX for 15 years. He is back-to-back champion of the famed Texas Steak Cookoff in Hico, TX 2004/2005 and has published a debut cookbook, Zing! By Gorji featuring his signature “New Mediterranean” cuisine that has won 5 awards. Gorji Gourmet Foods®, his product line for home cooks, includes Pomegranate Vinaigrette, Dipping Oil/ Marinade and three award-winning pasta sauces: Arrabiata Diavolo, Puttanesca and Pomodoro. They have won a total of 21 awards. They can be purchased at DFW area Whole Foods, Amazon.com, Gorji Gourmet.com and at Canary By Gorji. No Replies to "Celebrating 15 Years of Culinary Adventure"